Home / Bible Questions / Creation and Evolution / Is there evidence for a young earth? If we look carefully at the earth and its rocks, what do they tell us? Do they tell us that the earth is very old or do they tell us that the earth is young? Listed below are some evidences seen in rocks and fossils that tell us the earth is not very old. When we look at the mountains we may think that they never change. Running water such as streams and rivers (even rain drops) slowly wear (erode) down the mountains. Glaciers will break away rocks and carry them along. Geologists have calculated that it takes on the average several thousand years to erode one foot. If we use 5000 years as the time needed to remove one foot from the surface of the earth, it would take a little more than 25 million years to cut the land down one mile. In the mountains erosion would be much faster. Science textbooks may tell us that more than 500 million years have passed since living organisms became abundant in the earth. If that were true, erosion would have washed all the land into the oceans several times over. Obviously that has not happened. Mountains still stand tall and land exists well above sea level. As suggested above, water in rivers moves a lot of dirt and ground-up rock (sediment) down to the sea. When the river water reaches the ocean, it slows down and drops its sediment to the ocean floor. If this happens for hundreds and thousands of years, a delta is built up where the river enters the ocean. This is a fan-shaped projection of land that builds out farther and farther into the ocean. What would happen if this process went on for millions of years? In the case of the Mississippi River (Figure 1), calculations indicate that its delta would have filled the Gulf of Mexico in ten million years. Other smaller rivers that also drain into the Gulf of Mexico would shorten that time. 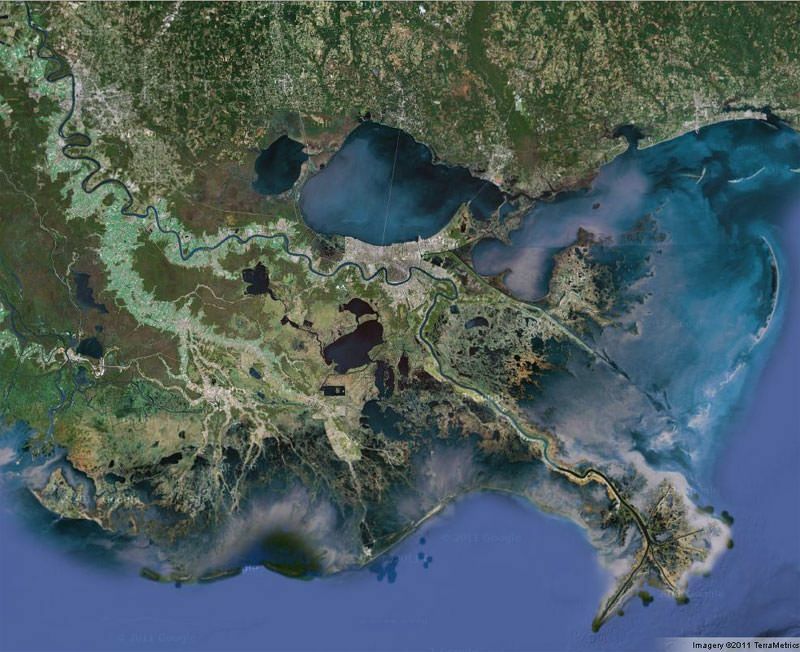 Since the Mississippi Delta now fills in only a small part of the Gulf of Mexico, it is obvious that the river has not been flowing into the gulf for many millions of years. Other rivers such as the Nile River of Egypt or the Po River of Italy have deltas that could have developed in only a few thousand years. These facts agree with the suggestion that rivers have been flowing into the oceans only since the major flood that covered the earth a few thousand years ago. In the Bighorn Basin of Wyoming and Montana in the United States, a 10,000 foot thick bed of sediments contains many land animal fossils. Geologists claim this is an undisturbed bed that has accumulated over a period of 16 million years. That gives an average of about 9 inches every 1000 years. Dead animals would surely decay and disappear if buried at such a slow rate. In mountainous areas today, adjacent valleys may be filling with soil and rocks much faster than 9 inches every thousand years, yet very few dead animals are being buried and preserved. Animals are most likely buried quickly and preserved by catastrophic activity such as floods, landslides, or volcanic ash. The continued accumulation of soil, sand, and rock undisturbed for 16 million years is an unreasonable proposition. The catastrophic laying down of 10,000 feet of sediment by a universal flood as described in the book of Genesis is a reasonable explanation that fits into the scenario of a youthful earth. Some modern animals and plants are called living fossils because their fossil ancestors are found in ancient rocks considered many millions of years old, but not in more recent rocks. How could they have been living and dying for many millions of years right up to the present but leave no trace of themselves in younger rocks? This is a mystery that geologists have difficulty explaining. Three other living fossils (among others that could be listed) that have left no evidence of themselves in younger rocks are the Tuatara lizard found living in New Zealand, Neopilina, a deep sea clam and the Gingko tree (Figure 3). All these were thought to have become extinct until found alive. They supposedly have survived for many millions of years without leaving any trace of themselves. If the time since these living organisms were buried by the Genesis Flood is only a few thousand years, the mystery of their survival is much easier to explain. 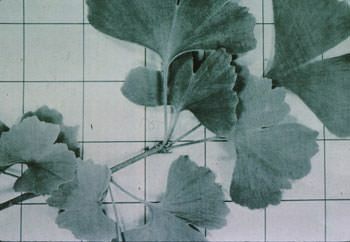 How long can living organisms stay alive? Fifteen to twenty years for a dog, 80 to 100 years for a human, and several thousand years for a Sequoia tree. How long can bacteria stay alive? Perhaps a few days or weeks? Most unusual are bacteria that have become cysts and have survived a long time buried in the ground. Some of these bacteria are found in rock considered to be many millions of years old. Yet the bacteria have been cultured in the laboratory and found to be still alive. A somewhat similar situation is the recent discovery that inside some of the large petrified bones of dinosaurs, soft unfossilized blood vessels and even blood cells are found. 100 million years (in the case of the dinosaurs) is a long time. There is no possibility for blood tissue and cells to remain unchanged for that long a time. Having survived for a few thousand years since the Flood when the bacteria and the dinosaurs were buried is still hard to believe but certainly a more likely possibility than survival for millions of years. Here are two examples of rapid geological processes that formerly were considered to take long periods of time. In 1905 the town of Thermopolis, Wyoming piped water from a hot spring over to its city park. The water was allowed to flow out of the top of a standing pipe. As it cooled, mineral deposits were left behind. 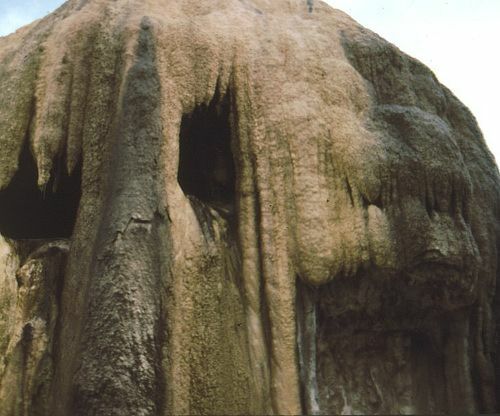 There now exists a large dome of travertine (a form of limestone) approximately 20 feet tall and wide (Figure 4). There are even small caves with stalactites and stalagmites inside. Large quantities of warm water with dissolved minerals could build up stalactites and stalagmites quickly in caves where tourists are now told these formation would take millions of years to grow. When stalactites from the ceiling and stalagmites from the floor grow and join together, a column is formed. In New Cave near Carlsbad Caverns in New Mexico, Indian projectile points were found in the soil and bat guano under the base of a large column. Obviously the column must have grown since the Indians left their points in the cave which could not have been hundreds of thousands or millions of years ago. Geologists have often noticed repeated layers of rock that have a common signature of coarse and fine sediments. They assumed that a lot of time was required to lay down the sediments that produced these rocks. In 1929 a huge mudslide slipped down the submarine slope east of Canada. Because it broke successive submarine transatlantic cables, the speed of the slide was calculated to have reached as high as 50 miles per hour. This mudslide spread out over several hundred square miles and extended out into the Atlantic Ocean for over 500 miles. It had a similar internal signature as the repeated layers of rock seen on land. 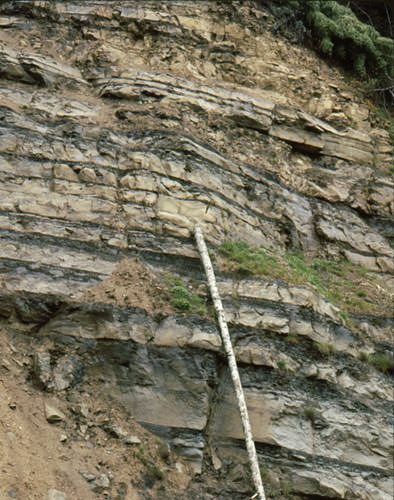 It is now recognized that many beds formerly interpreted to have accumulated slowly over long periods of time are actually giant mudslides (now called turbidites, Figure 5). This of course greatly changes the amount of time needed to for these beds. The settling of ocean basins and the rising of land masses that occurred during the latter stages of the Genesis Flood would produce optimum conditions for the sliding of water-saturated mud. Radioactive dating seems to suggest hundreds of millions and even billions of years for the existence of life on this earth. Assumptions geologists make regarding rates of radioactive decay and conditions on the earth in the past give cause to question the accuracy of these dating methods. In light of evidences such as given above, there is good reason to reject these long ages. As research continues, the evidence for life to have existed only a few thousand years will become more and more clear. Although all problems may not be solved, there is enough evidence for strong support to our faith in the accuracy of the scriptural account of earth history.